After consulting Trimeloni, which is reprint pertaining to the 1962 edition of the Missale Romanum, I confirmed (not that I needed to) that the server kisses things when giving them to and receiving them from the priest. (p. 423 – #447.1) He kisses the cruet and gives it to the priest, and kisses it when receiving it back. Both wine and water cruets. He doesn’t kiss the priest’s hand. 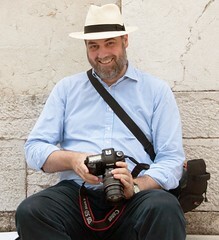 (p. 424 – #448.5) At the end of Mass he kisses the biretta and gives it to the priest, kissing his hand as he does so. Be SURE, of course, to make sure the middle "point" of the biretta is offered to the priest’s hand. If the priest saying the TLM would prefer that you not do this, don’t worry about it. But in 1962 that was the custom. The faithful of the diocese of Leeds are protesting against the closure of churches, including one where the Traditional Mass is said. The parish priest in that case, Fr Mark Lawler, is not even going to be given a new parish, rather undermining the argument that the motivation here is the shortage of priests. Here they are, with Oxford's contribution to their community included, on the first leg of the long journey to the Fraternity Seminary to Denton, Nebraska. It is wonderful that such a good solution has been found so quickly for them. 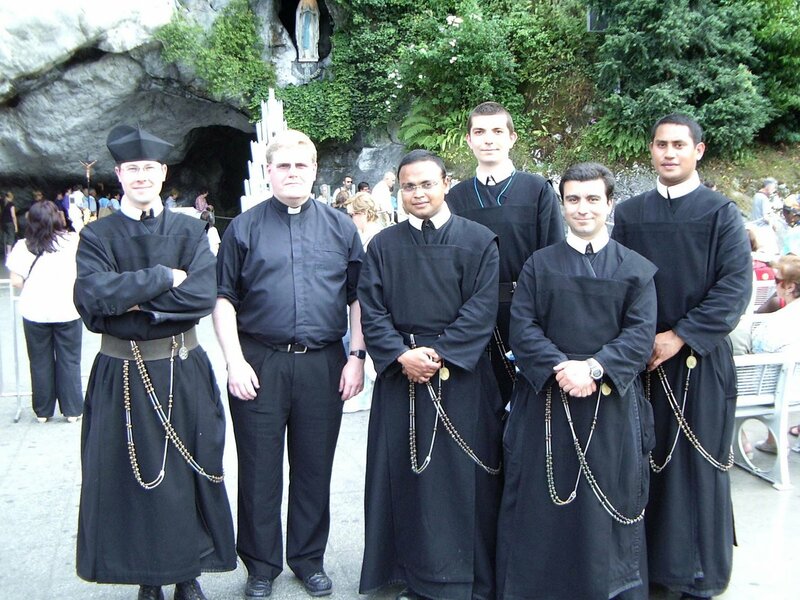 Some of them were spotted first at Lourdes: see picture below. Please say a prayer for them. Hat tip to Fr Finigan: here and here. This took place on Saturday 31st May, but so much has been happening since then it is only now that I am getting round to posting the pictures. It was a glorious day, the chapel was full of Catholic families from Oxford, Reading, Abingdon, and points in between, and, the feast being the Queenship of Our Lady, the celebrant, Fr John Saward of SS Gregory and Augustine, preached beautifully on Our Lady. The Oxford Gregorian Chant Society provided the music, under the direction of our professional coach, Mr Adrian Taylor. Afterwards the schola and a number of others had lunch in a nearby pub, the Pack Saddle, and then returned with the general public for a tour of this fascinating house, where Catholicism was preserved throughout penal times. The chapel itself is an important example of the chapels which served as de facto parish churches in the 18 and 19th Centuries. Surprisingly, formal parishes were not established in England until after the First World War. Mapledurham's secret attic chapel served the local population until the Catholic Relief Act of 1791 made it possible to build a publicly recognised chapel, albeit with neither a steeple nor a bell - it was consecrated in 1797. Unlike the chapel in the nearby Catholic houses of Milton Manor, there is a public entrance to the chapel from the outside, as well as a door from the main house for the family. Nevertheless it discreetly blends in with the rest of the house. As it happens the Anglican parish church is only a hundred yards from this side of the house. I very much hope to establish a sung Traditional Mass at Mapledurham as at least an annual event. The chapels of the Recusant Catholic houses of the Oxford area are of such significance for the preservation of the Faith, and above all the Traditional Mass, from the 16th Century right into the 20th, it is appropriate for us not only to pay our respects to them but to assist, in a small way, with their upkeep, which is often a headache for the extraordinarily dedicated families who live in them. As usual a number of people from the Oxford Traditional community were involved in the St Catherine's Trust Summer School, including me! It was our biggest ever Summer School, and as always a unique opportunity for children (ages 11-18) to spend a week learning about the faith: Catholic history, art, music, philosophy and social teaching, as well as catechesis from our Chaplain, Fr Andrew Southwell, with daily Traditional Sung Mass and Compline. There were also outdoors activities, drawing and sewing, and an opportunity for the boys to learn to serve Low Mass, Sung Mass and Benediction. A large group learned to sing a polyphonic motet, Elgar's Ave Verum Corpus, for the last Mass; a smaller group joined the liturgical schola to sing the Gregorian Chant propers. The first picture shows us singing Compline, with two cantors in cassock and cotta and Fr Southwell sitting on the right, in Ardingly College's large chapel. The second photograph shows two Summer School students who will be familiar to Oxford traditionalists; the third shows an Oxford undergraduate teaching a class. The Summer School is unique not only in what it provides academically, but also in bringing together students and staff from all over the country, united in their devotion to the Church's traditions, and the project of passing these on to the next generation. 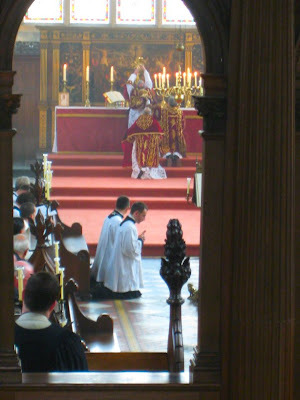 More photos and commentary is available on the New Liturgical Movement and the TCFA Ware blogs. More and better photos will be available in due course, and will be published in the Newsletter, which will be downloadable from the SCT website here.